Home Not Design a Website Yourself 8 Reasons Why You Should Not Design a Website Yourself? 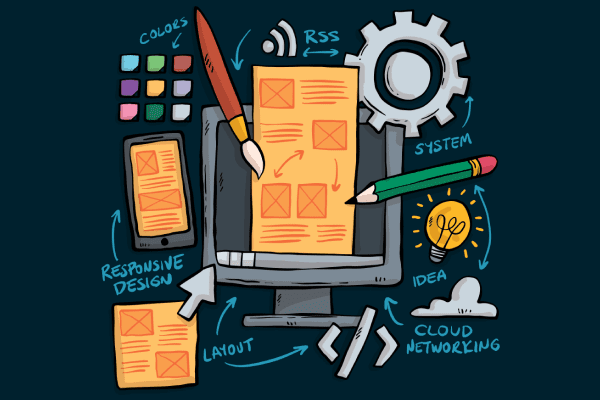 8 Reasons Why You Should Not Design a Website Yourself? You can! There are lots of software and tools available in the market that will allow you to design a website by yourself. Creating your own website with the tools and templates available across the web can work out for you. But you need to learn a lot in web design. To make a good good-looking professional website, you need to study more, learn things like Photoshop, Web Coding etc. Web design is not that easy. You made a website but what if it is terrible with search engines. The site may look good on your device but it may not look good or not even work on other devices. The site is of no use if it can not generate visitors. You need to keep learning, reading and redesigning your website because everything keeps changing in web design all the time. I want you need to be fully aware of the complications you'll face before you waste your time in designing your website. So read further. Here are some main reasons to avoid designing a website by yourself and take professional help instead. It seems to be the quick fix for getting your business online. But, the reality of self-built website is far from ideal. When you design a website yourself, SEO is probably the last thing you think of. Without SEO, your website will never appear on the first page of google. Which will ultimately fail to generate traffic. SEO or search engine optimization is an ever-changing world. Search engines' rules, algorithms and the factors they consider for optimization are always changing. In SEO, what worked last month might not work this month. If you don't have much knowledge about SEO, you could be making some critical mistakes with your website that could cost you much money and most importantly 100's or 1000's of visitors. Web design professionals spend a lot of time learning how to code a website that is optimized for search engine functionalities. They spend even more time to keep your website up with the constant search engine algorithm updates. They know the tricks to make appear your website among millions of other websites out there. The site you made may look great on your computer, but you will be surprised when you see it on your other's iPad. Compatibility is one of the trickiest things about web design. Different devices, browsers, operating systems and their versions display a website a bit differently. Professional designers have different devices and os available for testing so that they can check their work. Not knowing the standards for mobile websites and upcoming technologies can cost you big. You need to learn responsive web design to create and maintain a mobile version of your website. A professional designer can build your site using latest technologies to make to compatible across browsers and make it responsible for all the devices. Websites don't get built in a day or two. A professional website takes time and making it look good and functional will take even more time. Creating an effective website is hard work. It involves design and SEO know-how. And for this reason, self-built websites are inefficient. Designing a website from scratch is a very time-consuming process. Even if you use drag & drop tools, you need to do the altering to get it right. And that tweaking and altering will take a lot of your time. You might need to make ongoing changes for months to get a perfect website. And while you're making/learning website design, who will take care of your business?? Instead of wasting all your energy on building a website, you should hire a professional or use free html5 website templates and spend your valuable time on running your business. Self built websites lack in performance areas like- Search engine optimization, conversion, site traffic etc.. Unless you have sufficient knowledge of SEO, Is will be difficult to make your website Search Engine friendly. And because your website is not optimized for search engines, it will not easily show up on search results and you will not gain expected traffic or even no traffic and visitors. Professionals spend a lot of their time understanding and learning how to make sites optimized for search engine functionalities through the code they write. And even more time on keeping up with constantly changing search engine algorithms. Do you know that your website must need to load in under 5 seconds? Anything over 5 second and people will abandon your website. Coding of your website has the significant effect on the performance of your website. Professional web designers use various 3rd party tools and plugins to improve the performance of your website. A populate testing tool available is GT-Metrix which will rate the quality of your website's coding. If you are designing a website for the first time, you will likely not to get a perfect output as you thought. And remember, First impression counts. Your website conveys your business impression and credibility. Amaturely designed website will fail you to stand out from the competition. A professional web designer can deliver a high-quality credible design for your website. Even if you create a perfect website that took months of time, chances are there that your competitor's site will look more superior. Many businesses understand the importance of quality, which is why they choose to pay a web design company instead of doing it themselves. If you are trying to stand out then you’ll need a high-quality website then looks better than your competition. Navigation helps your visitors explore your website. They expect links and menus at certain places and navigation to work in a certain way. There is no theory written for this. Professionals have explored hundreds of sites and learned this thing. Unique designs make a site more interesting. But, for that, you need to include interactive elements, creative graphics, and visually attractive elements. When you're designing your first website, it is hard enough to get very basic elements to look good and function correctly. The major part of web design is graphic design. You might know how to design a graphic, but making it look appealing and interesting is the hardest part. And that is why designers spend a lot of their time on learning graphic design skills. The look and functionality of your website can make or break you. Doing it yourself will save you money but in long run, you will lose more revenue and credibility than it would have cost to hire a professional designer. Even if you do spend a few weeks or months getting it to look exactly as you want, chances are the final design is not what you’d get from an experienced web designer. Designing a website calls for special skills. And like any skill requires a set of tools to carry out the work correctly, web design does the same. There are number of tools you will require as a useful resources for designing a website. If you don't have these tools or don't know how to use them, you might not get the result you're expecting.